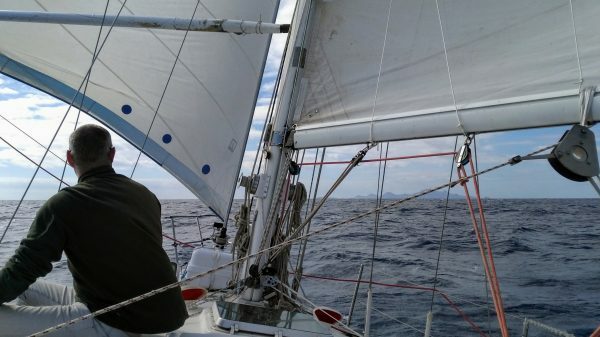 How to sail across the Atlantic when you’ve never been on a sailboat before? 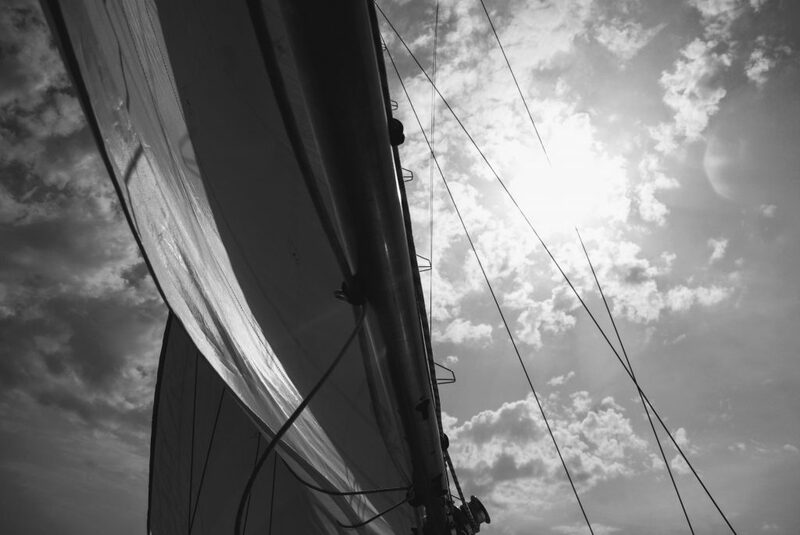 Are you dreaming of sailing? Then how about crossing the Atlantic and experience something unique in a lifetime? 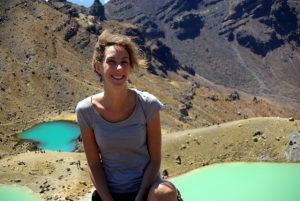 In my case the dream became an obsession after a trek in the Sahara Desert in 2014. I spent 15 days in a basic environment: wind, sand, mountains, some animals, gorgeous sunsets, moon rises, sunrises, moon sets, and thousands and thousands of stars. And us, only walking through in silence, humble with two camels, we were alone in the world. The nomadic lifestyle is that basic: walking, finding water, eating, getting some rest and contemplating the landscape. It is basic and beautiful. Everything was bigger than us. There I was, sitting on sand dunes wanting to one day answer that question: What would an aquatic desert look like? Nobody around except for a huge mass of water, only water, some birds and the wind as only propulsion means. Would I experience the same peace of mind? Haven’t you watched the movie The Perfect Storm? a bathing suit, a hat and sunglasses. Single-handed sailors, couples, even families with young children do it every year. More than 1,200 sailboats cross from east to west and take crew to help them with night watches and other duties onboard. Indeed, there needs be someone in the cockpit at all times for the 2 to 3 weeks that the crossing takes. There’re all sorts of crew: from experienced people to total newbies. There are a lot of travelers who hitch rides around on the continent and then try to hitchhike a sailboat to keep going on the other side of the pond! However, I realized that it required a lot of patience and perseverance to find the right captain for those who had never set a foot on a sailboat before. Therefore, I decided to learn how to sail first. Nothing is impossible as soon as you chop your project in little manageable chunks. Have you ever tried to climb 15 stairs in only one step? Nobody can. Even the ones with long legs. It hurts and it’s discouraging. But! Everyone can climb 15 stairs, one stair at a time! Everyone has their own pace. the slow/efficient/more economical way that is part of a long-term travel plan and consists in joining captains via crew or volunteering websites. 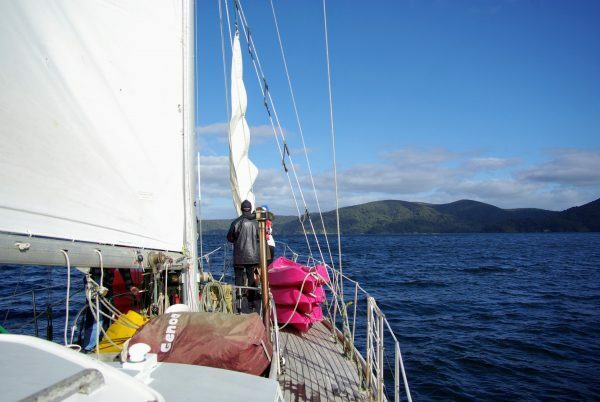 I picked the third way that allowed me to bounce between travel on land and travel at sea. Whatever approach you pick, crossing an ocean means that you’ll be living for a few weeks in a limited space with total strangers. And since you’re crossing (as opposed to cruising), there’s no way for you to leave the ship! Everybody isn’t OK with that. If you already struggle with your roommate(s), maybe crossing isn’t for you! Please keep in mind that captains welcome you to their home. A sailboat is an investment and might even be their only home! Respect their space and their rules at all times. Help as much as possible, contribute, and show your best smile! Being crew is truly a fantastic experience because there are many captains out there who take crew to share their passion and desire for exploration with open-minded, adventurous, and enthusiastic people just like you! I adore (yes, I lovvve!) systems like HelpX or Findacrew. There are plenty more and you’ll find the website that works best for you. Here are, in my opinion, the advantages of the crewing system compared to classic sailing training. The crew system is based on trust and good will. The more you want to learn, the more you’ll be shown. But mostly, as opposed to sailing schools where you share the instructor with other trainees, you virtually get unlimited access to the captain. Each time you join a new adventure, you learn something new. You discover different boats, different technologies, techniques, different navigation zones, weather patterns from one sea to the other. All those experiences will help you in the future and a good trick/practice learned with one captain can be shared with the next one. Sailing is a small world and you’ll meet other captains/crews at anchorages and marinas that might later invite you to join them sailing or for nibbles or recommend you to their peers. This is so true that I refused two opportunities to cross the Pacific! I stay in touch with captains I’ve sailed with and also captains I’ve met at anchor or on the pontoons… or at the bar. You never know when paths will cross again. No Pacific crossing for me this season because this summer, I’m again joining the captain I crewed with for a month last year in the Mediterranean. This time it will be a 3.5-month expedition: Balearic Islands, Spain, Portugal, Azores, Galicia, Brittany, Cornwall… and my partner is joining too! Your captains will share more than their boat and sailing project with you. They’ll also share their passion, their story, their anecdotes, and might become friends, or even mentors. Because every captain has once been a (young) crew and is happy to give back what he-she’s learned from others. Your captains will be curious and happy to learn about your next adventures, will advise you on the choice of your captain for the crossing. Of course, there’s a bit of everything out there. Reliable captains as well as dodgy captains. Generous captains as well as captains who are more interested in making money out of you. Some might ask for contributions of $25 to $50 per day on top of the shared food expenses even though their boat is not well maintained or even safe! To find the right captain, I would recommend you to be sincere on your experience and personality when writing your profile on a crew website or a crew advert to pin at marina boards. And then to clarify the situation/conditions and ask all the questions you need an answer for before embarking. With experience, you’ll get to understand what you want and what to pay attention to. 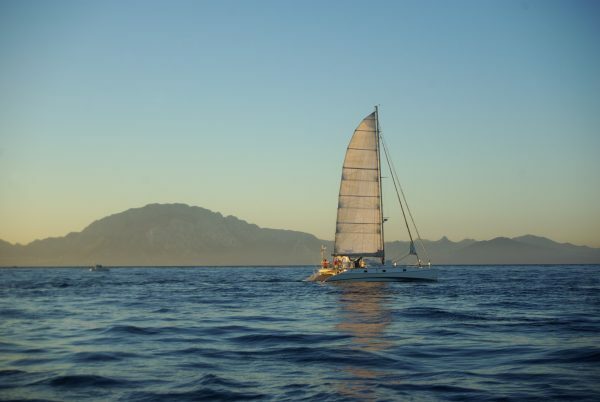 It’s very common that sailboats don’t get to port when scheduled because of weather conditions, technical problems, repairs, or family reasons. As crew, you need to be flexible to relocate, have some slack with timing and some money aside to cope with any change of plan. If you skip the sailing training, you’ll still have to join your captain where he-she is, pay for your food, and maybe also share the fuel cost and marina fees. I detail my own experiences below. Since there’s no possibility to leave the ship when embarking on an ocean crossing, I wouldn’t totally rely on crew websites. It’s very important to meet your captain in real life before committing. Spending time at the marinas to talk with captains instead of jumping at the first opportunity is my preferred approach. Taking time is key. And taking time means you’ll need food and accommodation for that period of time. In Las Palmas de Gran Canaria, the inexperienced boat hitchhikers spent weeks looking for the right sailboat, camping on the beach, getting a bunk from captains they made friends with, boat sitting, or living in squats! I preferred the hostel option, but our search was faster. On average, boat hitchhikers spent 6 weeks looking for the holy grail. How did it all work out for me? Since I had no idea how to enter the sailing world, I first used HelpX (helping hosts for room and board) before creating my profile on Findacrew. Then for the crossing, I posted adverts on French forums and Facebook groups and also opened an account on Crewbay and other websites. Hawila in her younger days. Amazing atmosphere & community life. 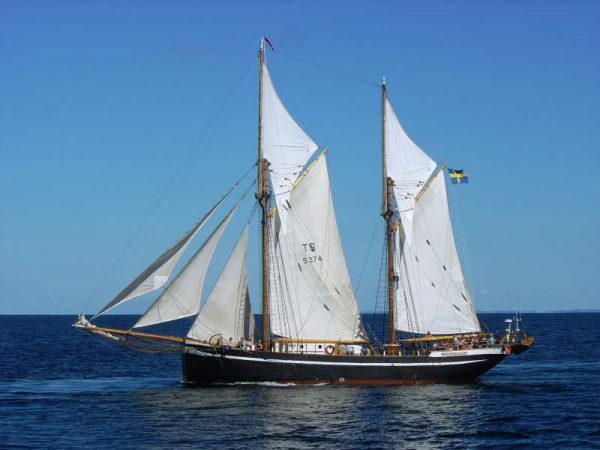 A great project and vision to revive cargo shipping by sail. Met several captains and had my first sailing sessions with a Danish captain who liked our project and visited us often. His sailboat was over a hundred years old and had no engine! Great for the life onboard and the sailing spirit. Loved the way the captain addressed the teenagers and the stories he shared with them! However, since we were many onboard, I didn’t learn as much as I wanted. 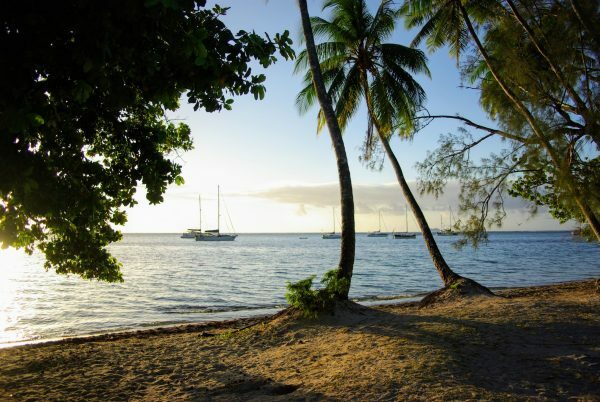 Change of plan: we should have crossed from Moorea to Huahine and then back, but the weather conditions were uncertain and the captain had no slack with his schedule. Alone onboard with the captain was perfect for me to learn the ropes. And since the sailboat was small, I had the right size and strength to do it all! 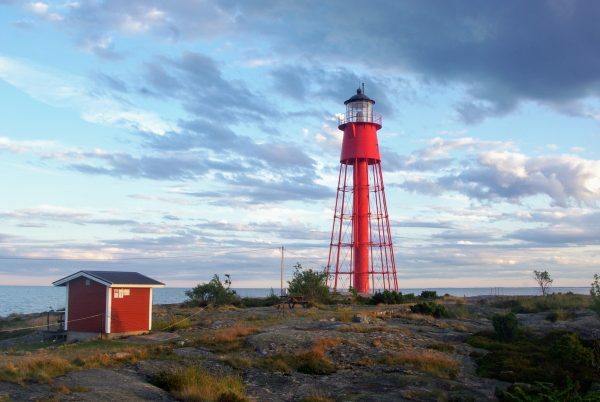 The lighthouse in Häraldsskär, east coast of Sweden. I was supposed to join the captain in Scotland but he had to turn around as he was crossing from Norway. Hamburg was then the second meeting point but a storm had the Captain head east. We finally met in Copenhagen and decided to explore the Baltic sea which he knows really well. One of his friends joined us later and spent three weeks with us. Another crew from Belgium finally cancelled his plans because it became complicated for him to join us in a different location. I was joining this captain because I wanted to experience several overnight crossings and sail the challenging Irish Sea, the English Channel and the North Sea. Instead, I had the best guide to discover the skärgårdarna (archipelagos) of the Baltic and learned a lot about the history and culture of the region, especially in Åland, Finland, Estonia and Latvia… places that were totally new to me! 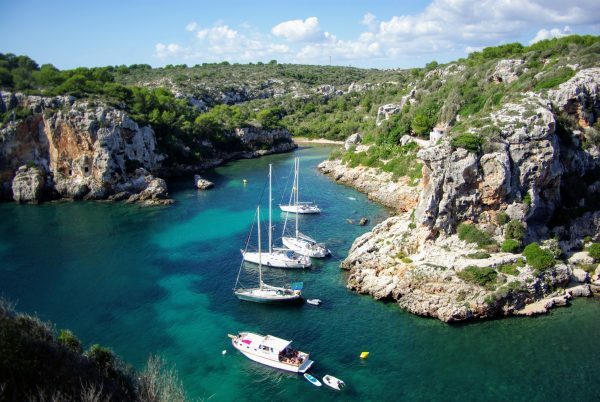 Cala Coves in Menorca. A stunning place! Amazing time together. The three of us will sail together again in the future! Since it was all new places to the three of us, the captain really had us participate in the decisions. We had many overnight passages where I was alone on watch and loved it. We discovered stunning places you don’t get to see from land and the whole stay was all very friendly and playful! Sunrise as we leave Gibraltar with our new friends, Morocco in the distance. First multi-day offshore navigation and confirmation of how much I a-do-re being alone on night watches. We were 3 hours on and 3 hours off, for 5 days. 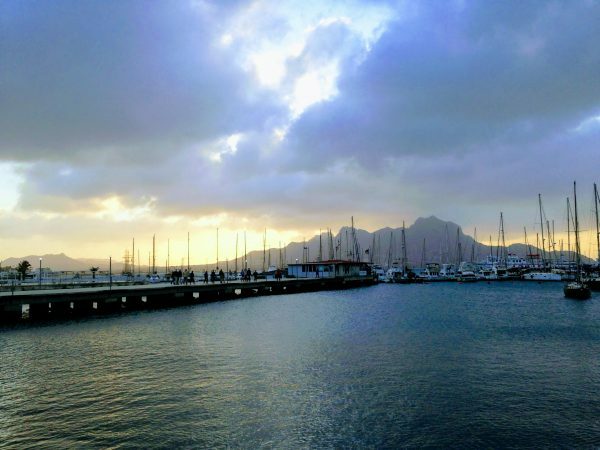 We waited for a week in Gibraltar to get favorable conditions to exit the Mediterranean (combination of tide, wind and current) and met other captains and crew I got to see again later in the Canaries. The atmosphere was great as we were all going in the same direction and shared the same dream. That’s when I realized that crossing the Atlantic was no longer a distant dream but my near future. Even though I didn’t have my own boat, I was one of them. It was obvious for everyone. I was about to cross. Only with the right captain. Land!! Getting closer to Porto Santo after 120 hours at sea. Sunset from the marina in São Vicente, Cape Verde. Crossing with the trade winds isn’t the most technical navigation but requires to be confident with night watches so the captain can get some sleep and rest. We had strong winds and high swell. We were cautious not to push the boat too much. You don’t want to break anything “Better safe than sorry”. In the end, we crossed quite quickly. More about the crossing in an upcoming post! Landfall in Barbados, 365 hours and 2056 nautical miles later (= 3808 km = 2364 miles). This is how my crossing dream came true. I met extraordinary people all along the way (captains of course but also other sailors, crew, marineros, boat hitchhikers…) and all of them contributed in their own way to make it happen. So, back to you. If crossing an ocean sailing is also one of your dreams, I urge you to believe in your dream, give yourself the means, and the time to go for it. Because crossing an ocean is a unique experience of time suspension, out of this world. It’s actually more difficult to describe than to do! 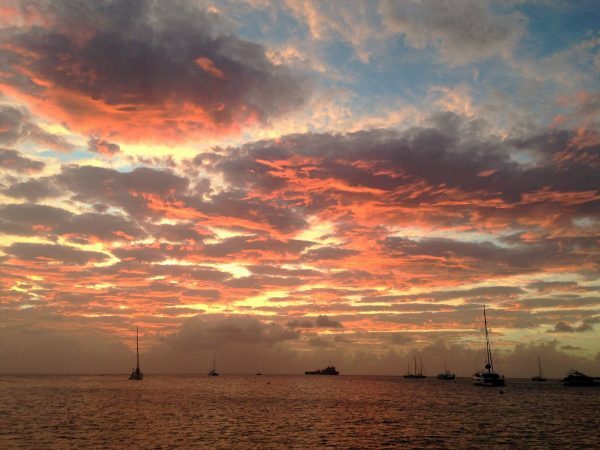 So what are you starting today to pursue your (sailing) dream?